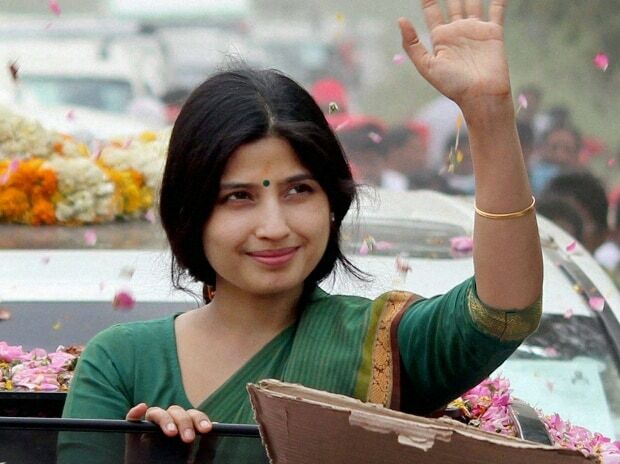 Samajwadi Party candidate and sitting MP Dimple Yadav Saturday filed her nomination papers for the Kannauj Lok Sabha seat in the presence of her husband and former chief minister Akhilesh Yadav and BSP general secretary Satish Misra here. Dimple Yadav, a two-time lawmaker from Kannauj, who has represented the Lok Sabha seat since 2012 when it was vacated by her husband after he became the chief minister, claimed that the victory margin will be "bigger" this time with the SP and the BSP entering into an alliance for the polls. Before filing her papers, Dimple Yadav along with Akhilesh Yadav took part in a road show atop a rath (chariot) from Faguha Bhutta in the presence of large number of SP and BSP workers and leaders who chanted slogans. The roadshow, which stopped at the local SP office, was given a rousing reception by the women workers who braved the sun and showered flower petals at their leaders. Coming out after filing the nomination, Akhilesh Yadav said "a wave for change is blowing in the country" and the government of the (grand) alliance will come to power in which the role of BSP, SP and RLD will be important. Recalling that Kannauj had sent Socialist thinker Ram Manohar Lohia and SP founder Mulayam Singh Yadav to Parliament, Akhilesh Yadav said he too was elected from the seat and exuded confidence that Dimple Yadav will win the seat this time by a "record margin". "The people of Kannauj are themselves fighting these elections ," he said. Mentioning the development works undertaken during his government including the expressway, he alleged that the BJP stopped development and worked against the promises made by them which has led to unemployment. "All, be it youth, farmers, labourers and traders are today feeling harassed.... The BJP only spreads hatred," he alleged. Responding to questions from newspersons, he said the media is showing the alliance (op opposition parties) as gaining ground in surveys. "The BJP has entered into an alliance with 40 parties and yet they are raising fingers at the alliance of opposition parties," he said. Earlier, Akhilesh Yadav and Dimple Yadav also offered prayers at the Devi temple on the first day of 'Chaitra Navratri' Saturday.